As the first round of the European Championship came to an end on day 3, the spotlight was on 4 teams who fought head-to-head for the remaining two spots in the top 8. In pool A, Germany faced Sweden, while pool C results brought a battle between Austria and Ukraine. In the end, Germany and Austria secured that desired spot and unlike Sweden and Ukraine, they are on their way to a historical success. We spoke to the representatives of all the teams involved, to see what their thoughts are on the decisive games and future goals. "Our goal was to go the playoffs, there's no secret about that. Right now, it doesn't feel good. Germany was playing really well today, while we were standing on our heels and weren't as prepared as we thought we would be." 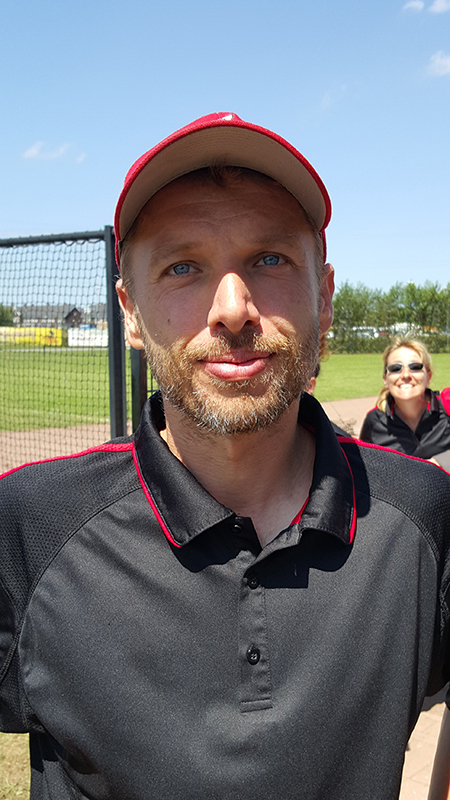 Q: Germany - as the visiting team - started the game with 5 runs in the first inning. Did that set the tone for the whole game? "Totally. We weren't shocked, but we started making small mental errors that we normally wouldn't. We tried to work our way through the bunting game, but the Germans did everything perfectly. I'm not saying it's just the players, us coaches... everybody - we weren't prepared for that kind of action right away. And they did well, the Germans, so congrats to them." Q: What are the goals for the rest of the tournament? "To stay healthy, we had some small injuries, so changes had to be done for this game - for example a new catcher, and a catcher is one of the key elements. And now we just go for the wins. We have to do that, we were set up for the playoffs, but now we will try to end at the 9th spot." You're missing one of your key pitchers from the last championship in Prague 2013, Johanna Grauer, how has that affected your performance? "We miss Johanna - she was the number one pitcher and played well for UCLA. It's just unlucky that the USA junior national team had to have her*, when they have 7.242 other pitchers to pick from. 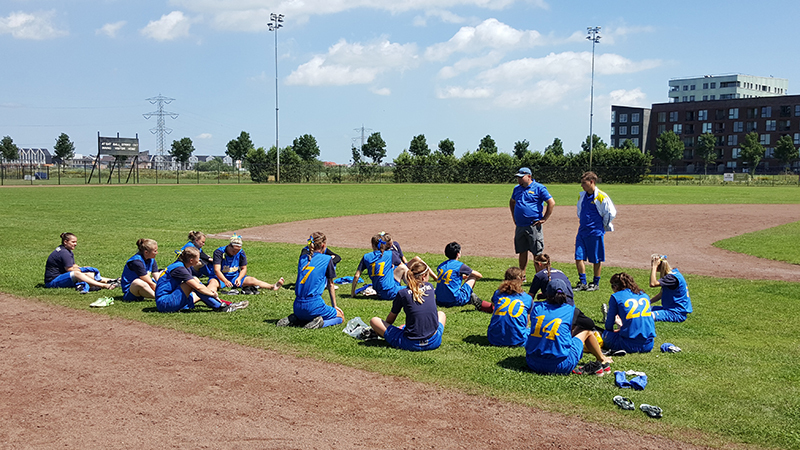 And this has ruined the game for European softball, because it's not only that we want to win, it's good for European softball to have good, competitive games and good pitching. And everyone knows that pitching is the number one thing in softball. We have great defense, but we do miss her." "Me included (laughs). We scored five points early and that opened up the game. I think the next really important point was to get the momentum back to our side after we'd let them score 3 runs. We got back with more than 3 runs and that was the big turnaround." Q: You've finally made it to the top 8 after placing 9th in Italy 2011 and Prague 2013 - nothing but smiles on your faces, would you consider this a successful year already? "It sure is. Now pretty much everything is open. I wouldn't say that it doesn't matter anymore [how we play] - we could still attack the positiion of the other teams, but I don't know what's going to happen. Our objectives were partly met - our first goal was to be in the top 8. That makes the difference for the draw process next time. It was the most important thing. And you shouldn't forget, that now we play against the better teams, which creates more experience for the players in this tournament and brings more exciting games. We're still here to win! To be honest, maybe not the title, but we'll try to get as close as possible." Q: What made the difference in this particular game? Errors? "Yes, maybe one, or more errors - but it's a game, we understand that these happen. It was more of a result of the agressive pressure by the Autrian offense, a great coaching on their side. Our girls have been playing together for 8 or 10 years, so they are experinced and don't make many mistakes, yet in our country, we have a few games at a similar level. And we have no pitchers with the skills of Martina [Lackner]. Pitching is our problem, but we take steps in the development of our pitchers every year, so maybe in the future, we will have it." Q: How close do you feel you were to the top 8? "We were very close - we missed that one step. Our biggest problem was the Austrian pitcher in this game, we decided to utilize bunts and slaps, but without success. It's because we don't have practice at this level. We had the top team of Czech Republic, then some big games against Slovenia and Ireland - but we are trying to take steps to hopefully reach the top 8 in the future. Now we will play every team with the intention to win. We have 3 to 4 games against teams of our level, so we're ready for them. Our aim is the 10th place, which would be an improvement from the last Championship, where we placed 12th." Q: What was the key to your success in the game against Ukraine? "We knew we had to be aggressive on the bases. We were actually able to get some runners on bases in the first two innings, but we couldn't bring them home. A little bit of luck was missing, because we had some good hits, but the Ukrainian players made great plays on defense." Q: How would you rate your performance in the tournament so far? "It was pretty good, we had some good games - today, the game was almost perfect. Our pitchers are doing well and our offense is hitting, overall we're doing fine." Q: As the tournament unfolds - what is your plan? "We've reached our first goal, which was to play within the top 8 teams in the playoffs. We'd like to get to the highest position possible, but we know there are only good teams, we've already seen everyone and so we know how tough it will be. As for the final standings, there are wishes and estimations - we'd like to be in the top 6, but you never know." *Johanna Grauer holds both US and Swedish passports, but she is representing the United States at the Junior Women's World Championship in Oklahoma City, OK and as the Olympic Charter states in Rule 41, she's thus ineligible to play for Sweden at the European Championship.